Built in 1905 as a wedding present for B. Paul Mossman and his bride, the Castle is of the Richardsonian Romanesque style. Masons gathered granite boulders from fields hundreds of miles away to be used in the construction of this magnificent home which is on the National Register of Historic Places. 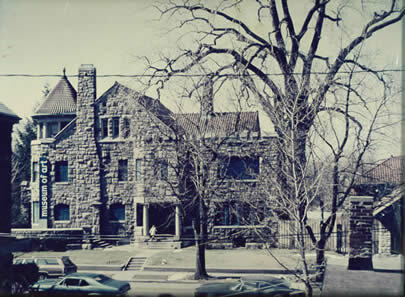 In 1949 Mossman gave the home to the city to become the municipal art museum. In 1983, the museum moved downtown and the castle was restored for residential use. More than a thousand gallons of stripping solution, hundreds of dental tools and hours of time were involved in returning the original cherry, oak, maple, walnut and mahogany to its present state. Jody Hemphill Smith and Mark Paul Smith re-established the Castle as an art gallery in 1995. Since then it has featured artists from around the world. Castle Gallery shows are exciting events. This web site is designed to introduce you to the thrill of gallery viewing and to help you select fine art for your own space. Art enhances any home or business. ©2013 Castle Gallery. All Rights Reserved.